Sorry this is not a DIY post! 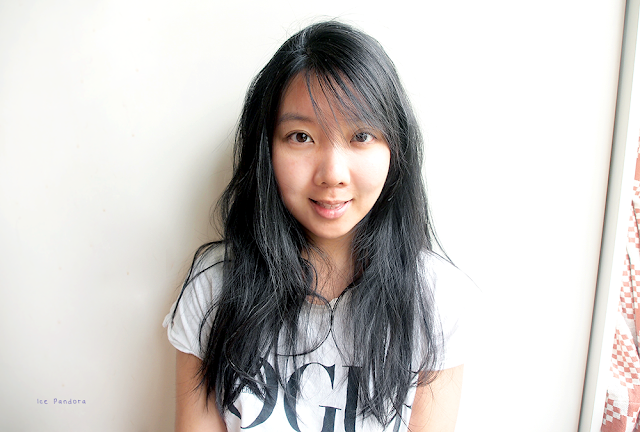 But yesterday I have cut my own bangs/fringe! It’s not my first time cutting my own bangs but I never really followed any guidance or tutorials until now. But before that I just comb my hair in front of my face and cut my hair horizontally right under my eyes and I thought I was done! It never really looked 100% neatly but I was ok with it. Messy or what I would like to think a rebellion look can be charming too right? But yesterday I wanted to do it the ‘right’ way and what better place to learn things and do them at home it’s from a computer screen with Youtube! In the search bar I typed the words ‘cutting own bangs’ and clicked on the first and best looking video with many views. And I’ve watched this one! A very well explained video by a girl named Chloe and she’s a hair guru! People did complain of her talking too much in the video but I find the complaining injustice because a) she talks really clear, b) is lively and c) has a lovely voice. And thanks to her I’ve learned that it is important not to cut your hair horizontally but straight up and sectioning your hair is really a must. The result of my bangs looks better trimmed and neatly than my previous hair cutting and I’m really happy with it! It’s still covering my eyes a bit but I want to wear it side ways and this length suits me perfect. Sorry maar helaas, dit is geen DIY post! Gisteren heb ik mijn eigen pony geknipt! Het is niet mijn eerste keer in het knippen van mijn eigen haar, maar heb ook nooit een handleiding of tips gevolgd maar deed het op mijn eigen manier: mijn haar naar voren kammen en mijn haar horizontaal recht onder mijn ogen knippen en klaar was ik! Vond ik. Het was nooit echt 100% netjes, maar ik vond het wel prima want een rommelige of zelfs een rebelse look kan leuk staan toch? Maar gisteren wilde ik het wel ‘goed’ doen en wat betere plek om dingen te leren en deze thuis uit te voeren dan op een computerscherm met Youtube! In de zoekbalk typte ik de woorden 'cutting my own bangs’ en klikte op de eerste en de beste video met meeste viewers. En het werd dus deze video! Een zeer goed uitgelegd filmpje door Chloe en ze is een haar goeroe! De mensen klagen over dat ze veel praat, maar dat klagen vind ik onterecht, want a) ze legt het duidelijk uit, b) is levendig en c) heeft een aangename stem. En dankzij haar heb ik geleerd dat het belangrijk is om je haar niet horizontaal te knippen maar recht en haar scheiden is een must! Het resultaat van mijn pony is daarom ook veel netter dan voorheen en ben er heel blij mee! Het valt een beetje voor mn ogen, maar ik ben ook van plan mn haar naar de zijkant te dragen en deze lengte is daarom perfect. Some of you have noticed how quickly my hair grows back. Even my friends in real life notice and of course myself. I don't know what it causes because I don't use any special hair treatment. I guess I'll blame to my genes. Same thing with my natural grey hair! You did a nice job! The style looks really cute on you. i do this sometimes when i feel like i wanted to have bangs and i don't want to spend money for a few haircuts. haha! anyway it looks good on you sweetie! Wow awesome job it looks wonderful! It looks amazzzzzinggg! 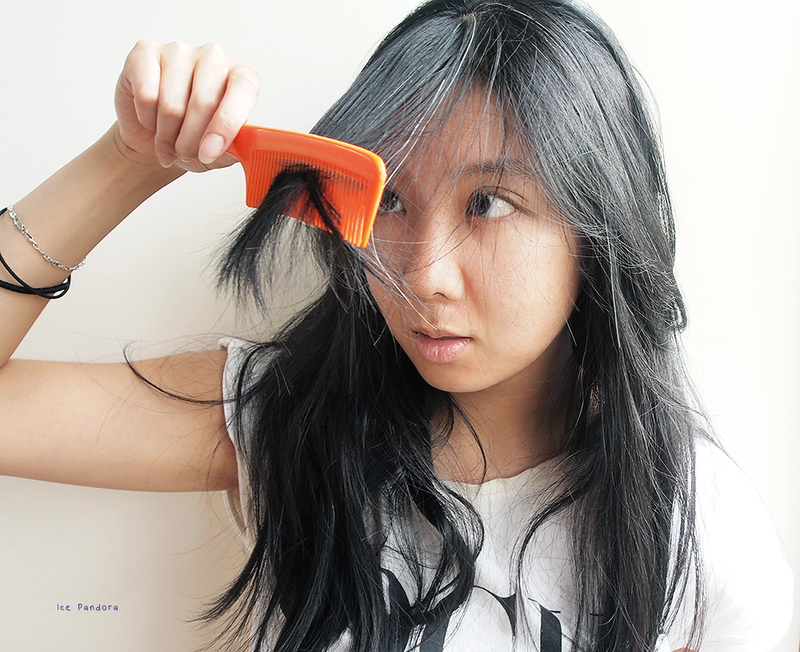 Saves time and money :) I used to cut my bangs all the time but after a while I decided to let them grow. Your fringe looks lovely! I would have never done it myself because I would be scared of messing up! It looks great on you. :) I've always wanted side swept bangs but I don't think it fits my face sadly. You did a pretty good job! 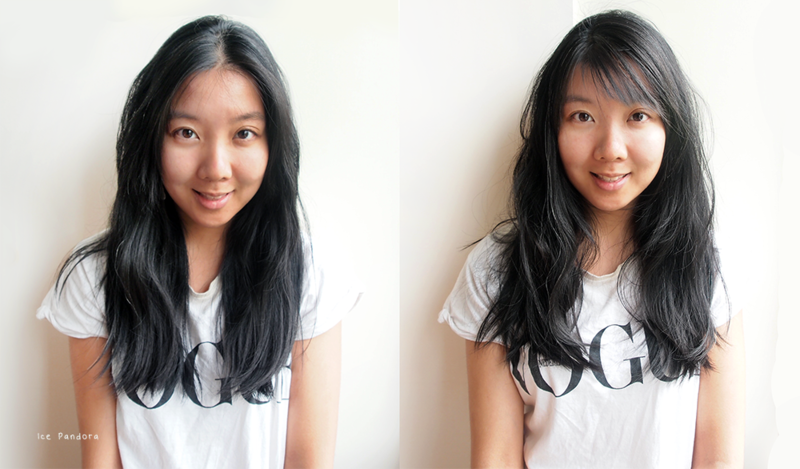 I have also cut my own bangs before...unless one wants a perfect result, I think it's okay to do it yourself! You look super cute with that hair cut ! Your bangs look great! I always cut my own as well. Aww, you did such a good job! I've never had real front bangs, so I haven't done this ever. o_o; I feel like I'd accidentally casually shave my head off. Long time no see! Your hair is really pretty. I am envious of your natural gray! It looks good! I never could do it so well when I had bangs, haha. You did a great job! I've cut my own fringe before but it's never turned out well haha. I used to cut my own hair all the time (for 6+ years! ), but now I'm leaving it to a professional to do it. It's nice to feel pampered at the hair salon hehe, but if I want bangs I think I'd cut them myself. You look so good with or without them, I love the natural waves in your hair :) By the way - love the most recent yarnfood post! It seems like comments are disabled for it, but when I looked at the thumbnail I thought it was real desserts before I saw the title! Good work! Lucky it didn't end in disaster! My friend recently tried to cut her own full bangs and she did very badly lol. i remember watching the same video! i watched so many before cutting mine! i trimmed them myself for over a year and finally got them trimmed by a professional when i went to get my whole hair cut. you did a great job! Looks great! 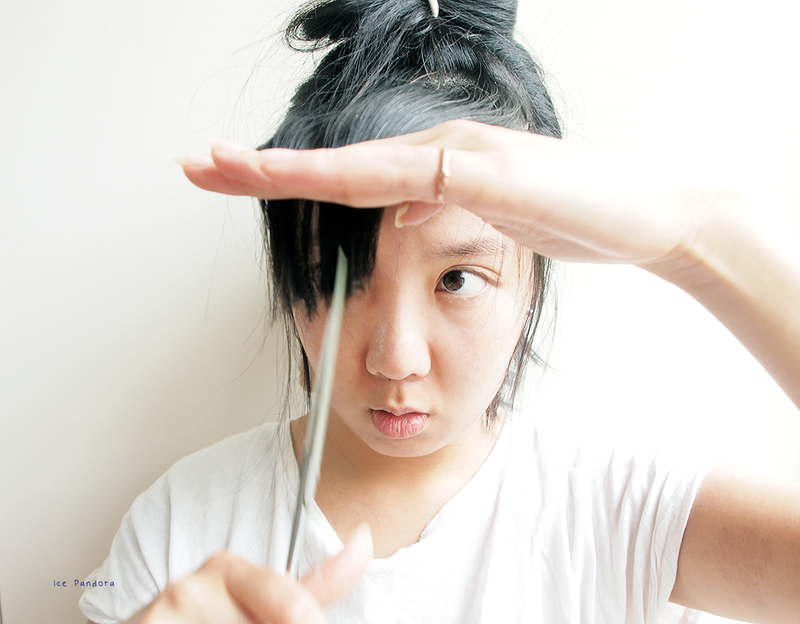 & you're right-- sectioning off the hair when you trim your bangs is super important! I cut my own bangs as well! It's way cheaper than going to the salon once every couple of months to get them cut!